The idea presented is the following: buying a luxury item, in this case a sports car, gives money to those who contribute to the design and manufacture it through their wages, and this is a good way to distribute money in a dignified way. It is true that when you buy a luxury item, or anything, for that matter, wealth is redistributed to another person or amongst a few other people, but in reality, this redistribution is not an effective way to improve the lives of others. What percentage of the purchase price of this car do you think went to the people who made/shipped it? The distribution of money spent on the car is heavily weighted to just a few already wealthy individuals along the manufacturing chain. Only a very small proportion of the money spent will go towards the income of those who do the manual labour required to mine the materials, for example. This is how business generally works: for maximum profit. Furthermore, the increased price of the car is not reflected by the wages given to those at the start of the manufacturing chain. They will be paid the same whether they are mining copper ore for a Corvette or for a car one fifth the price. We must compare the 'good' that is done by buying a luxury car to the other things we could do with the money. 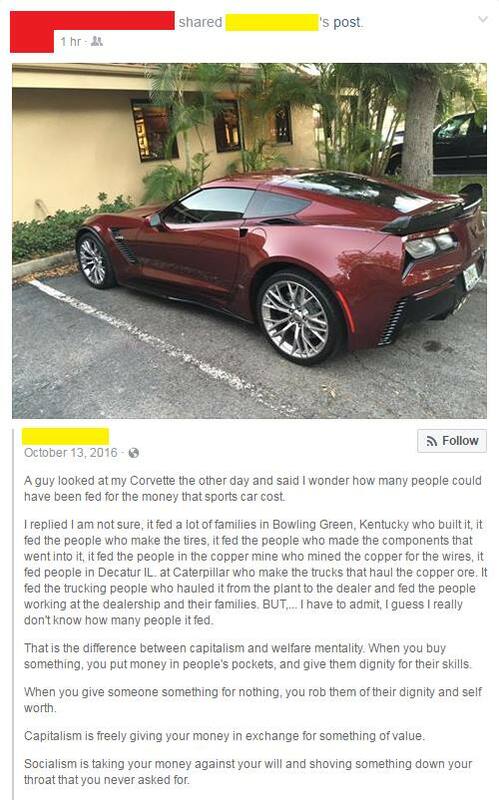 If you must buy a car, which is a reasonable thing to want to do, then getting a reliable car for a fifth of the price of the Corvette in question would provide all the same wellbeing increase to the workers, but would leave four fifths of the money you would have spent to either spend on other items for yourself, which might reap some additional wealth distribution to those who manufactured the items, or better yet, you could donate it to one of the most effective charities. This would improve or save the lives of hundreds of people (or animals) who suffer most in the world in the most effective way possible. Lets say, for sake of argument, that the difference between the price of this Corvette and an alternative cheap car is £20,000 (which is probably an underestimate). This money, if donated effectively, could avert up to 30 years of blindness for about 260 people with trachoma, a painful disease that leads to blindness which is easily and cheaply treatable, but affects many of the world's poorest because they don't have the infrastructure or funds to treat it*. Additionally, if you still think that buying things is an effective method of wealth distribution through the wages of the manufacturers, then the interventions used by the charities will require buying and using items, such as mosquito nets, or pharmacutical products, which will contribute to feed the families of the manufacturers of those items as well as the direct reduction of suffering that the effective charity does. Its a win-win situation! "How can you justify buying a $1 million gem-studded laptop," you ask your friend, "when so many people have no laptops at all?" And your friend says, "But think of the employment that this will provide—to the laptop maker, the laptop maker's advertising agency—and then they'll buy meals and haircuts—it will stimulate the economy and eventually many people will get their own laptops." But it would be even more efficient to buy 5,000 OLPC laptops, thus providing employment to the OLPC manufacturers and giving out laptops directly. Spending money on a luxury car influences the world (through supply and demand) to allocate more resources and labour to the luxury car industry, and therefore away from more 'necessary' industries. This is why buying a Corvette is not a good thing for those most in need. These people need money spent on, and therefore labour and materials allocated to, for example, clean water infrastructure or a good health service, not expensive cars to appease the desires of the richest few. The money spent on a luxury car goes to further the wealth discrepancy in the UK and across the world, not decrease it. Of course, I cannot stop anyone spending their money as they wish, but to justify buying luxury items on the increased wellbeing that is brings to others is at best an ignorance of the better options for increasing the wellbeing of others, or at worst a fake justification of a selfish purchase. The content of this post was inspired by a post in the effective altruism discussion Facebook group. * Using information from GiveWell's assessment of The Carter Center - Trachoma control programme, which estimates up to 30 years of blindness can be averted for every USD$100 = £77 donated (with a USD->GBP exchange rate correct as of 7/6/17).